When it was pouring rain on the day we had scheduled their engagement session, Rosie and Diego decided not to let the rain stop them from doing an outdoor shoot. These two are awesome! From sitting in the wet grass to jumping in puddles, these two were up for anything. 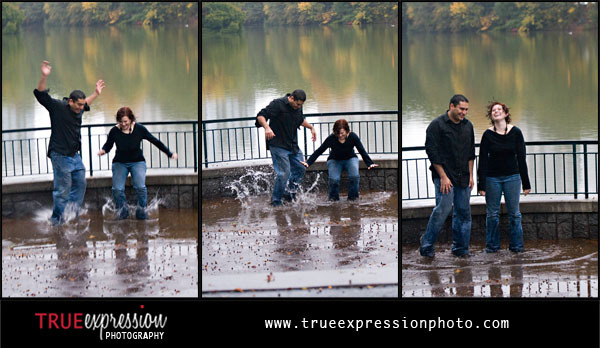 Here is a quick sneak peek for Rosie and Diego from their rainy session. This first one was one of the last photos of the sessions and one of my favorites. By the end of the shoot they were soaking wet! More photos and the slideshow will be up soon. Rosie and Diego, thank you both for such a fun shoot! Love that spot in Piedmont Park! It's great that you took advantage of the low clouds and gloomy day.